Many offices try to make the most of their email accounts, calendars, or Outlook to plan their projects and stay in constant contact. But anyone knows that with growing teams and complicated projects, email can be very lacking, and teams are often challenged to keep each other in the loop as things move at a fast pace. Luckily, there has been an explosion of development for apps and programs to help teams communicate better, consolidate lists, and tag each other in on projects in new ways, and the results have been phenomenal. One of the biggest challenges at work (and in life) is to communicate consistently and accurately, and it can actually take a lot of effort and brainpower to ensure that your team is carrying out mundane tasks like marking appointments, sending around their progress, and taking the time to write reports. This is why apps like Slack have become so essential to growing businesses. The team is able to focus on the task at hand, rather than the process – leaving room for more creativity and ultimately more productive work. If you’re thinking of bringing in a new program to manage your office communication, you’ve likely heard of Slack. Slack is a popular option for a reason, but there are thousands of other options to be considered in your search. 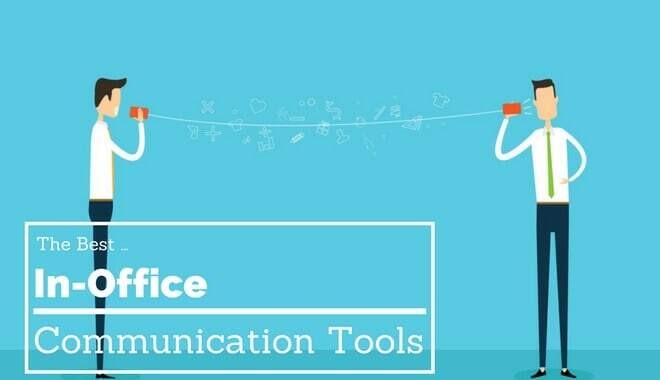 We’ve put together a list of programs for in-office communication that you should definitely consider in your search, with great features that rival what Slack has to offer. If you’re trying to link busy teams in your office, Slack is definitely a very good option. With increasingly complicated technologies involved in all aspects of work, Slack provides an excellent way to tie teams together, share projects, and quickly communicate on emerging items that may evolve quickly. What is great about Slack is that it is like many other messaging softwares, easy to use and intuitive. You don’t need to be a programmer to figure it out, customize it, or get your team up and running. Slack is also a top choice for freelancers, who need to manage multiple projects and teams, who may not work with one another. With constant developments, and ongoing integration of other platforms (such as Wrike), it really is a great option to try. If you’ve given Slack a shot and it isn’t what you’re looking for, however, there are endless options for you to try! If you love all of the features that Slack has to offer, but are itching to add some features of your own, Mattermost is definitely an option to consider. This open-source software takes all of the abilities that Slack offers, and adds encryption, compliance monitoring, and customer support capabilities. This makes Mattermost an ideal choice if customer service is essential to your business, or customer support teams will be making use of the new program. Because it is in open-source development, people around the world are creating solutions for problems that your business is likely to encounter, and you get to take advantage of every addition. What’s more is that the pricing is absolutely affordable at any company size. If you’re looking to connect your internal communications with your interactions with your external clients and projects, definitely give Mattermost a try. If Slack is lacking on a few features you find essential, and you need another level of oversight for your business, start working with Mattermost. Like Slack, HipChat will connect you to the people in your office, and offer a way to work through things quickly and effectively. Many companies use HipChat for the basic chat interface, to keep in communication. But HipChat actually offers a whole range of features, and goes beyond what Slack offers to provide solutions for customer service issues. If you have a front-facing business, and teams that have many customer service demands to keep up with, have a look at HipChat and how they integrate the different parts of your business. HipChat offers a great free trial that let’s you explore if it will work in your office. This is a great chance to check things out, see which features work for you, and only move to the paid edition when you are absolutely sure it works for you before committing to a system. Some offices find that the free version covers all their needs. So if cost is a huge consideration, consider checking out this program to get a sense of what works and what doesn’t. With many similar features to Slack, Jostle actually offers a few more API integrations, and data options for your team. Plus, there are some gems that will really boost your team’s productivity: calendar management, conferencing, and social media integration, to name a few. These features have helped a lot of users ramp up their group-work, and customer communications. If you’re looking to get a busy team dialed-in and supporting a new technology, these features make the commitment easy for your team (who might be reluctant to take on yet another program). Jostle boasts an impressive user-uptake, and has been highly praised for use on large teams and complicated projects. It costs a little more each month per user than Slack does, but reviewers have actually rated Jostle as more worth their money than slack users. Jostle is also the better alternative if you’re looking to manage a few stores or businesses online, with the ability to switch between shops as you work, so make sure to check it out. Team Tracker is an app to consider if you work in sales, manage a huge number of hourly-employees, , and want to integrate task and employee tracking into your communication. Call centres, and groups working on large-scale projects have found Team Tracker to be essential. Supervisors are able to get a look at the workload and amount accomplished at a glance, and employees are quickly able to organize their workload. Team Tracker also offers the option to share learning experiences with small groups, or broadcast them company wide-meaning you can keep everyone informed of updates as soon as they happen. No matter what technology you choose to try to keep your staff connected, each of these reflect a huge advancement over the basics offered through things like Excel or Google Calendar. Keep in mind that no system will work well unless your employees invest and truly learn to use it to the fullest, so be sure to implement group training, targets, and ways to assure that each member is dialed in to the new program. If you have a large team, you might want to consider having a small group test-pilot one of the programs before launching to everyone. Slack is a leading option for a reason: it provides simple, easily accessed, and affordable technology advancement for almost any typical office space. That said, with so many excellent options out there, be sure you give all of these programs a look before diving in. They may save you from having to change over in the future, and may provide features that allow your team’s creativity to explode.